Departement of the Alpes de Haute Provence - Pop. : 5.000 inh. From highway A7, take exit Avignon Sud, then RN 100. From highway A5, take exit La Brillanne, then route RN 100. 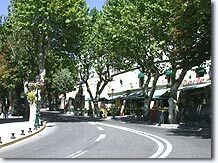 Situated between the mountains of Lure and Luberon, the Forcalquier country is a major attraction in Haute Provence. From mountain top to plains and from valleys to looping hills, you will be entranced by the landscape and abundant vegetation, wherethe heady aromas of lavender and other fragrant plants waft in the air. As you walk about in the middle of wild flowers and terraced olive groves, you will discover cabins and stone "bories" traditionally used here by the local shepherds (There is more information concerning tours at the Tourist Office). 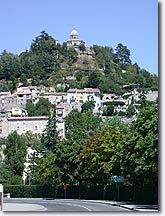 There is a wonderful view of Forcalquier and the area from the Citadel. 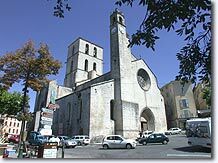 If you go late Sunday morning you can hear the carillon played manually (the only one in Provence) at the Chapelle Notre Dame de Provence. Don't forget the Monday morning market which spreads its lively colors through out the city. It is the weekly meeting of all the farmers, craftsmen and locals... lots of atmosphere! In a more serene setting the old city is lovely with its narrow streets, shady squares, and elegant 13th and 15thc. houses. 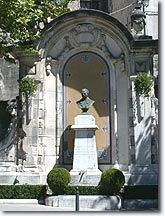 Forcalquier also has a rich cultural life. Many writers, painters, and sculptors, charmed by both the beauty of the site and the warmth of the people, have decided to settle here. Citadel Notre Dame de Provence (1875) and its carillon. 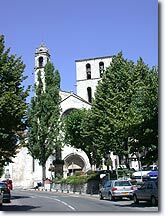 Notre Dame du Marché.Cathedral. 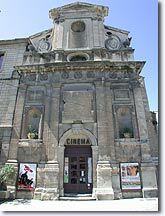 St. Jean Church. The Franciscan convent Les Cordeliers (13thc.). Les Visitines convent and cloister (17thc.). Municipal museum : furniture, local costumes, archeology. Tennis. Fishing.Outdoor heated swimming pool. Fête du Bd La Tourette : first week end of July. 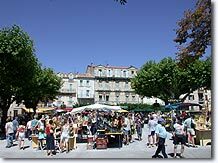 Provence products Fair : Early August. Mane (4km), Pierrerue (5km), Saint Michel l'Observatoire (10km), Lurs (12km).